I’d like to put the pointers to prev/next posts below a post as well as at the top, preferably between the post and any comments. Is that possible please and, if so, how? That makes sense: if someone reads to the end of a post and then wants to read the next post, they shouldn’t have to scroll back to the top. Having these navigation links at both the top and the bottom makes your blog more reader friendly. Fortunately, this is easy to accomplish with Graphene. 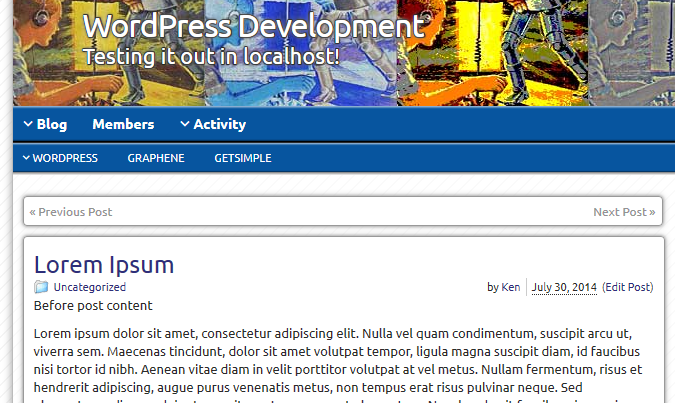 WordPress is written in PHP, a scripting language that allows us to create and use functions. We’re going to be adding this code to a widget area, but WordPress doesn’t allow the use of PHP in a widget area, so we’re going to use a plugin that will allow us to do just that. 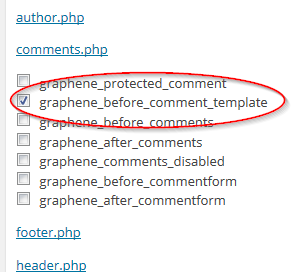 There are a number of plugins that will allow you do this; I happen to like the WP PHP Widget plugin. I realize that when you visit that page, you get a warning that this plugin hasn’t been updated in two years and may not be compatible with newer versions of things. However, I have looked at the code and it’s pretty simple, and I use it on a number of sites with no issues. It just works. But if you want to use another one, you should get the same results. Note: You will need to install and activate the widget before you start this. 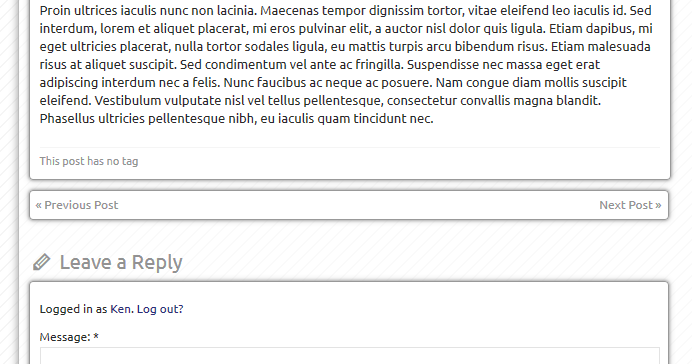 An action hook is basically a shelf (either in WordPress or a theme) that you can set something on. Graphene has a number of them built in. I already wrote about using them in this tutorial. If you know what they are and how to use them, you’re ready to go; if not, you probably want to read that tutorial and come back here. That’s the code we’re going to use to replicate those links. If you want these links elsewhere, you can select a different widget area, but this meet’s the OP’s needs. Here’s where it’s going to get even more simple, because most of the code I showed you above is created by those two WordPress functions. Be sure to click “Save” at the bottom of the widget area. That will make those links really big. This kind of thing usually takes a bit of experimenting and tweaking, but it is possible. Enjoy. Works like a charm. The only tiny little problem is: The bottom navigation links only show when comments are enabled. Not a problem for me, since I leave them enabled anyway; just leaving this message in case someone else faces this problem.